Stargate SG-1 turned a dramatic corner as its eighth season drew to a close. With the Goa’uld defeated the Jaffa warriors were free, ready to establish their own homeworld — Dakara — and establish a government. Taking her seat on the new Jaffa High Council, representing the Hak’tyl, was a familiar face: Simone Bailly as Ka’lel. We had a chance to sit down with Simone at Gatecon: The Invasion and had a fun chat about her first appearances (in “Birthright” and “Sacrifices”) and rise through the Hak’tyl ranks, plus her character’s startling turn in Season Nine’s “Stronghold.” She also tells us about her appearance in the upcoming CBS adventure drama Blood and Treasure, and hints at what she hopes might be Ka’lel’s return to the screen one day. GateWorld’s conversation with Simone Bailly is available to watch in full below! The complete interview runs about 19 minutes. You can also listen to the audio version by clicking on the player above or subscribing to the GateWorld Interviews podcast. Be the first to know when brand new Stargate interviews are released! Subscribe to GateWorld’s YouTube channel, and click the bell icon to turn on alerts. GateWorld: For GateWorld.net I’m Darren Sumner. I’m so excited to be here with Simone Bailly — Ka’lel from Stargate SG-1. Welcome to GateWorld! Simone Bailly: Thank you for having me! I love GateWorld. GW: We’re here at Gatecon 2018. It’s the end of a long, fun convention. Can you just share a little bit about the time that you’ve had here interacting with fans, and why you do these events? SB: Yeah! It has been an incredible few days. I always make sure I can be here for the entire thing. It’s such an awesome time for everyone — all the cast, all the people who worked on the show and the fans to come together. And it impresses me so much that people fly in from all over the world to congregate. And then they make friends, and we start to see some familiar faces. Everyone is so lovely, and it really is Stargate family. And that is what it is! And even working on the show, that’s always what it was. It always felt like family. GW: It really is — the Stargate family extends from the people who were there every day to the people who came in and did guest spots, to the fans all over the world. GW: I want to go back and hear your story about casting, when you originally got onto SG-1. You started [doing] a couple of Hak’tyl episodes. We’ll talk about the later council stuff later. But Season Seven’s “Birthright” was your first episode. SB: Yeah! And at that time I was fairly new to acting on TV. I had formerly been a theater actress. And I’d performed with the Shakespeare Company and toured. And I don’t think I had any idea when I got that audition for Stargate how many years it would continue. And the journey that I’ve been on has been amazing, and incredible, and I’m so grateful for it. So when I walked into the room, I did my audition, I got the role … I was so ecstatic. I thought it was just a one-episode part. And it evolved into three seasons recurring. So that was really, really cool. And I loved the Hak’tyl stuff, because Chris Judge created my character. He wrote “Birthright” and “Sacrifices.” And it’s nice that he such a personal thumbprint on the show, and he was already so integrated on the show anyway. It was really special for me. 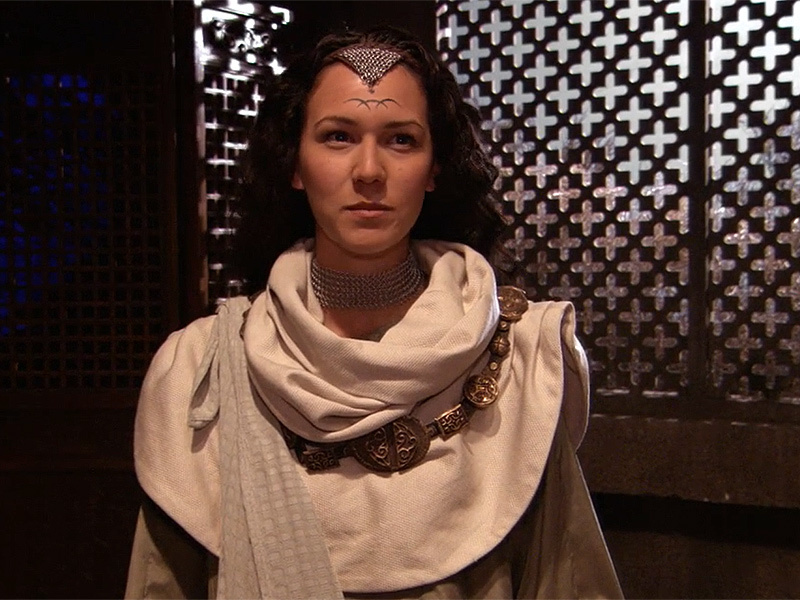 GW: Moloc was the name of the Goa’uld. SB: Yeah! They were an all-female, warrior women tribe. And it was just so cool — even as an actress to step on that set and be part of that colony of women. We’re wearing like leather and chain mail! It’s just such an awesome, empowering role. And those are the kind of roles that I’m very attracted to as an actress. And it was just a really incredible experience. Unforgettable, for sure. 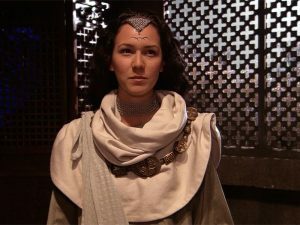 GW: As Chris as a writer, and as the rest of the Stargate production team, is developing this new group of people — this new warrior race — and they’re figuring out who the Hak’tyl are, how do you step into that role as an actress, and figure out who Ka’lel is as part of this community? SB: I think as an actress one of the things I do is I take my cues off of the script. You have to endow a lot of trust in the writers that they know the show (well, especially Chris Judge — of course he knows the show! ), that they have crafted something that if you just read it — I always take my first impressions from it, whatever that is. It could be sensory. It could be, “OK, what does that make me think of as an actress?” Or “how can I envision myself in this?” So I kind of have my own process. Because I was formerly trained in theater — there are certain things that I can do to review a script, and look at the tone. Also it helps when you’re familiar with the show. GW: Those tricks translate between the stage and the screen? SB: Yeah, absolutely! You want to fall in line with what the show is doing, and be part of it — complement it. That’s really important. GW: Now, if I remember right, “Birthright” is largely location stuff. You’re out shooting on location. And then in “Sacrifices” the Hak’tyl end up coming back to Stargate Command. What stands out in your memory about those shooting days, and how the location stuff differs from the stuff at the S.G.C.? 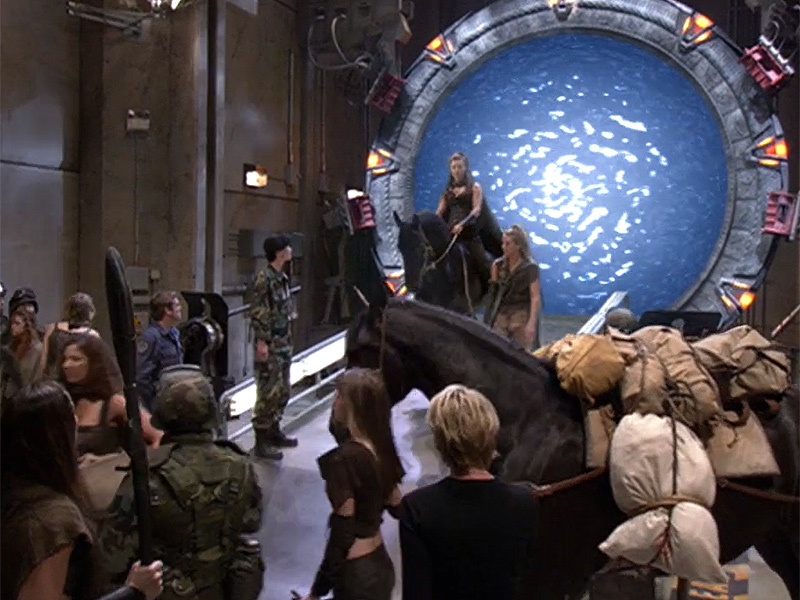 Going through the Stargate was one of Simone’s favorite things about the role. I got to go through the gate twice. So it was really special, yeah. And it was also fun too because we had a horse on set that went through the gate in “Sacrifices.” And I am oddly allergic to horses. I love horses, but I’m very allergic. So it was funny watching the A.D.s [assistant directors] be like, “OK, the horse is over in this wing and Simone’s over there. We have to separate the horse and Simone!” so my eyes don’t close and my mouth doesn’t swell up. SB: Very allergic, yes. Yeah. I have ridden a couple of horses in my youth. And my body just did not agree with that very well. But that was a lot of fun. GW: Do you have memories of shooting any particular scenes with the main cast — with Rick or Michael, or Chris or Amanda? And Amanda constantly impresses me with how she had such an ease and command of her dialogue always. And she’s just so professional and such a kind and amazing human being. And everyone was like that. All the cast were just lovely. And it was always a pleasure to work with everyone. 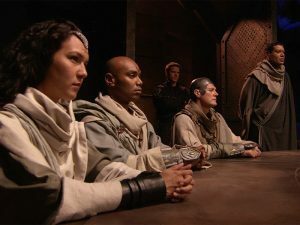 One of the funny stories I have is when we were filming later episodes in Season Nine, when we were doing High Council stuff. There were two main studios that we filmed in. So there was Bridge Studios, which a lot of people even at this convention are going to visit — which is awesome. And then there’s another studio called Norco Studios. And Norco Studios was like a tin box. It was made of metal, and we were filming in the summertime, and we’re wearing as High Council members these heavy, heavy robes. And then another thing is I am one of those people that is deathly, like anaphylactically, allergic to tree nuts — to nuts, right? And so at one point we’re at the High Council area and Chris Judge is across the room firing off pistachios at me, not knowing that I am deathly allergic to nuts! So I keep going [dodging left and right] “No! No! Stop! No! No, really, I’m going to die! Stop!” And he’s like, “Ha ha ha ha ha …” pelting them at me. But luckily I survived! So that’s good. SB: Yeah, exactly — cat-like Jaffa reflexes, for sure. GW: So the show is on for such a long time, [and] it’s such a central part of the Vancouver film industry. Lots of folks do kind of one-off roles. Maybe a character comes back a second time, like you were called back in Season Eight for “Sacrifices.” But then you get called back again in Season Nine. SB: Again! That was what was so cool for me. Because in the earlier episodes, when I first started in Season Seven, we were on Hak’tyl and I was kind of lower in the ranks. And as the seasons progressed I seemed to somehow get up there. And all of a sudden it’s like I’m leading the planet, and I’m the representative for my tribe. GW: She wasn’t bumping people off, was she?! SB: No, no … she wasn’t that duplicitous. But it was also really cool because I think — correct me if I’m wrong — I’m pretty sure I was the only female council member on the High Council. So that also was pretty incredible for me. And then the other thing that really impressed me was I got to act with Lou Gossett, Jr. And I’m a huge Enemy Mine [fan] — which is a feature film from way back that I remember watching when I was younger, and just being really enthralled with his performance. So to be at a level playing field with Lou Gossett, Jr., who is just a phenomenal actor, that — definitely the fan girl in me was like “Eeee!” But I had to keep my cool. GW: And his character Gerak was just … he steam-rolled through Season Nine. He was just a presence. The whole experience was amazing. I have nothing bad to say about Stargate. It’s the best. GW: A really positive experience in your career. SB: Absolutely! Yeah. And that’s why I love being at conventions like this. Because it’s just such a celebration of that love, and appreciation for the show. 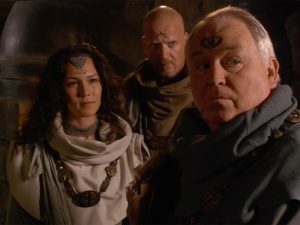 GW: With “Reckoning” at the end of Season Eight there’s this shift: the Goa’uld are defeated, the Jaffa are free, and there’s going to be a new Jaffa Nation. The Jaffa are going to be a people, headquartered on the planet Dakara. That’s the starting point for Season Nine. 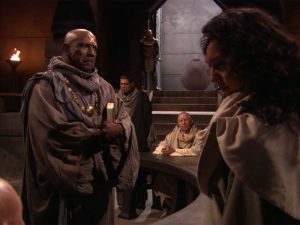 And Season Ten with the free Jaffa story — it was this moment in Season Nine, when we started to see those council scenes, and I recognized conspicuously there’s one woman on the Jaffa High Council. Of course! Of course there must be, because of the Hak’tyl. The Hak’tyl have to have a representative. So I had this “ah-ha” moment realizing who Ka’lel was, and realizing that they didn’t just go create a new character and cast somebody new. They pulled somebody from those two episodes. 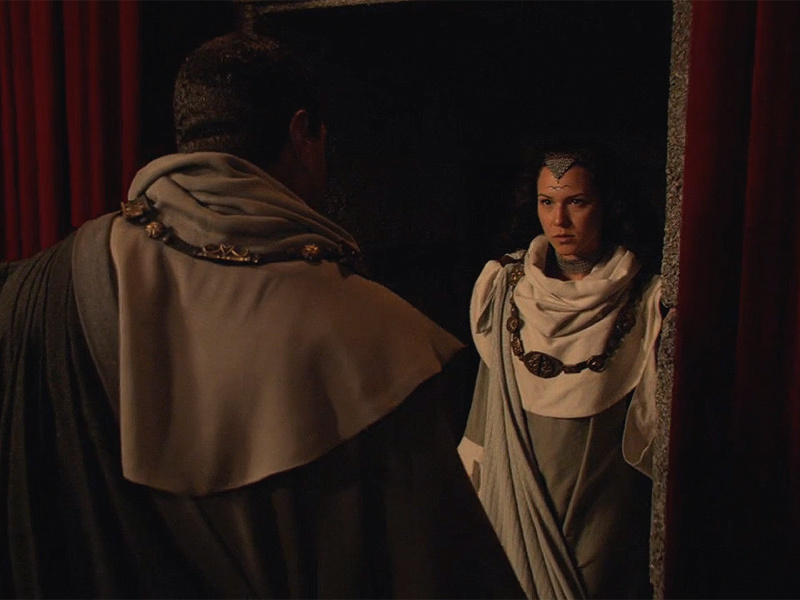 Ka’lel sat on the leadership council of the new Free Jaffa Nation, appearing in four episodes in Season Nine. SB: Luck me! [Laughter] I’m like, “Yes! Great! That’s so good — I get to play again!” It’s nice. It’s just fantastic. I just love everybody so much. GW: The Season Nine story that you’re recurring in as Ka’lel moves the Jaffa toward democracy. That’s where they get to in the episode “Stronghold.” But “Stronghold” — which, correct me if I’m wrong, is the last for your character — there is this really interesting, kind of uncomfortable twist with Ka’lel. SB: Because she gets brainwashed. And she zaps Mazrai. Yeah! And then it’s kind of “dot dot dot …” Who knows what happens? GW: Let’s talk about the “who knows what happens” in a minute. But first what did you think when you got this script and you read this turn — that she had been brainwashed? SB: Yeah, the zat guns are cool. And what was nice was one of the fans brought one of those [to Gatecon]. And so I got to play with it again. It’s really fun. GW: … she’s now working for Baal. That glimmer in your eye is just deliciously evil! SB: [Laughter] Well maybe it’s because I’m half Chinese. But yeah, it was a lot of fun. That episode also — I think that was the episode directed by Peter DeLuise, who is the most extraordinary director to work with. And we had a lot of fun as well doing that. That was really good. GW: So continuing the character’s journey: We can only speculate as to what happens to Ka’lel. 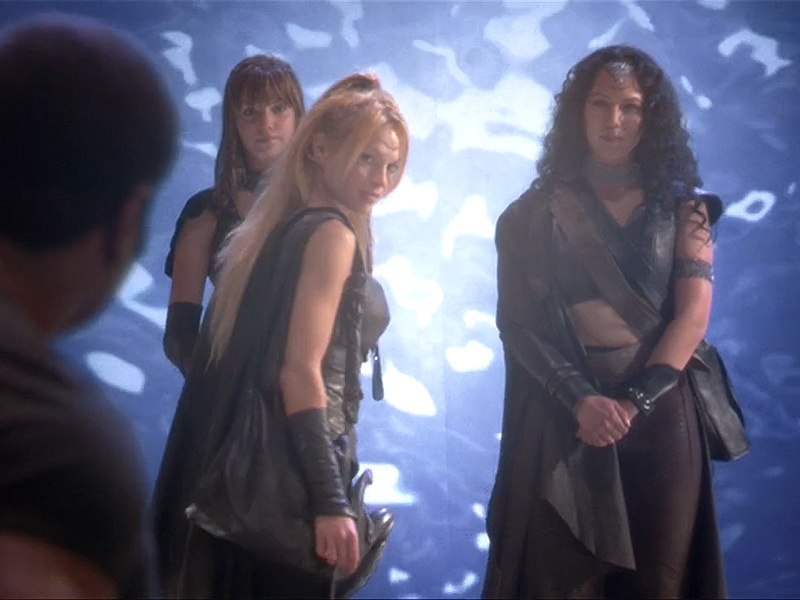 We just rewatched the episode, and there’s a reference later in the episode about Ka’lel — they went back to her and they got the intel that allowed the team to go and save Teal’c from Baal. So what do you think happens to Ka’lel after your last scene? Is she rescued? SB: I think she goes back to normal. And I think she comes back better and stronger. And I would love to see more from her … [Laughter] Wink-wink! GW: So should the stars align you would be willing to revisit this character? SB: Absolutely. Absolutely. Without even a hesitation, of course. GW: Now it’s been a decade, and where are they at and how’s this whole democracy thing working out? GW: That’s a story that might have a place for a High Councilwoman? 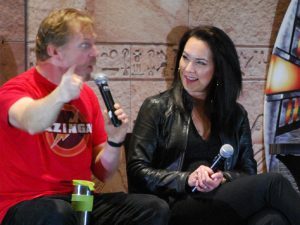 Simone appears on stage alongside Alex Zahara at Gatecon: The Invasion (2018). SB: Yeah. 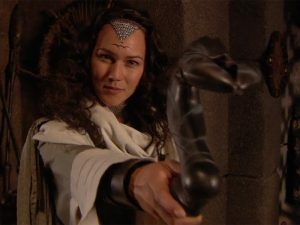 And also, I don’t know if it would work, but in my mind I would love to see a new Stargate-inspired show to do with the Jaffa. And in my involvement it almost be like a Xena: Warrior Princess — where it’s just like awesome, diverse, strong female role stuff. And we can carry on the same values from SG-1 into a new series. I think that would be really cool, and just be a really great show about exploration and humanity, with that warrior spirit that the Jaffa have. Because that’s what I loved about Stargate. It had a lot of play and fun, but it also had a lot of humanity, and action. And you really never knew what to expect on the other side of the gate. And I think there’s a potential for so many more great stories from that. GW: What are you doing these days? What can we look for you in, now that Stargate is (for now) receded into the sunset a bit? SB: I just came back from filming in Montreal on a new series, which is an action-adventure series — similar to maybe like an Indiana Jones but modern-day, with flashbacks. SB: And it is about an art antiquities expert and a cunning thief. And they team up to track down and stop a known terrorist who’s funding his terror through art — which, if you look back at Hitler back in the day, that is what happened. They would plunder all these countries and take their art and antiquities, and steal it for themselves, but there is also a lot of currency there, too. 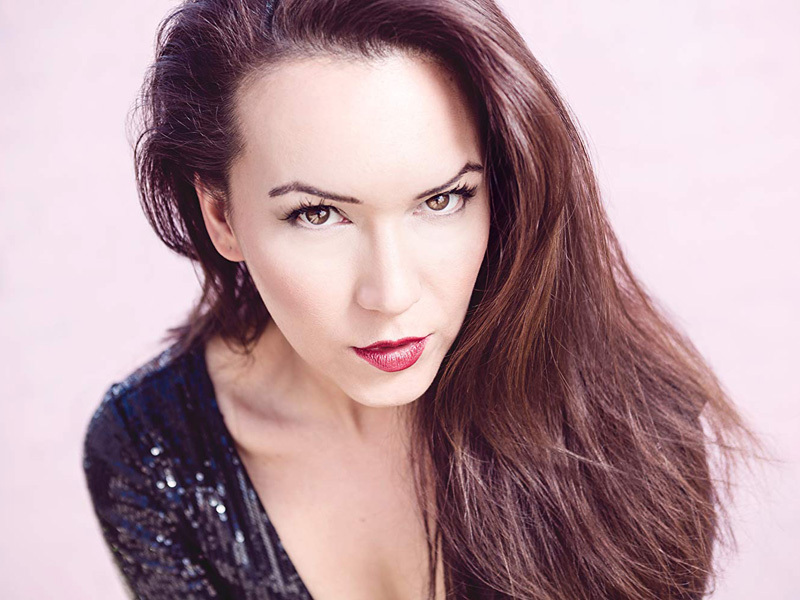 Simone played opposite James Callis in “Daybreak,” the series finale of Battlestar Galactica. And the show is called Blood and Treasure. And I got to work with James Callis again — Baltar from Battlestar Galactica. He and I had worked on the show finale of Battlestar together. So it was just extraordinary to be reunited with him again on a new series. So that’s coming out. Blood and Treasure is coming out in summer 2019 on CBS. And it will also be available on Amazon. And I can’t wait. So please tune in! It’s going to be so good! GW: Sounds like a really cool show. SB: Yeah, it’s going to be great. It’s going to redefine CBS, absolutely. It’s like nothing you’ve ever seen. It’s a big show. And they’re filming in Montreal, Italy, and Morocco — travels all over. It’s extraordinary. Can’t wait. GW: This has been a real treat for me! Simone, thank you so much. I thought the Hak’tyl storyline was one of the show’s weakest, unfortunately. Most of the characters in the tribe were not that interesting.